This study aims to examine risk-taking situations among students during holistic craft processes. The study was conducted during the spring terms of 2013 and 2016. The data comprise interviews of seventh-grade students (2013), in which they defined solutions found during craft design and production processes, and digital learning diaries (2016), in which students self-evaluated craft design, production and evaluation processes. The results show that making crafts includes risk-taking during every phase of the process. These are situations in which students either take risks or avoid them. 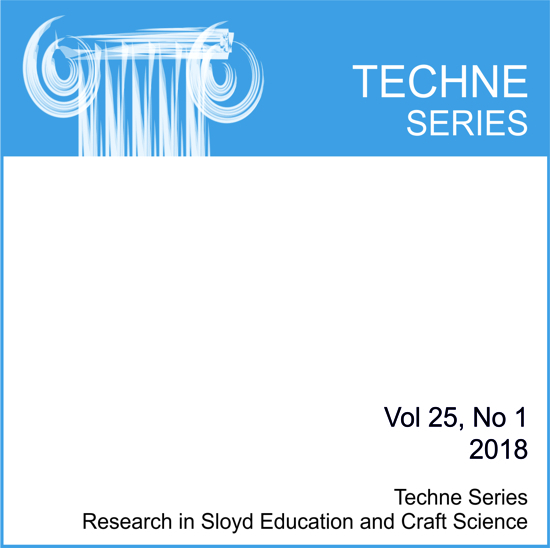 The results reveal that risk-taking situations related to economical risk are emphasised in the design and production phases, in which the students make decisions regarding the product to be made and the techniques to be used. Psychological risk-taking is particularly connected to the production phase of the craft process, in which the students begin production and progress through its phases. Social risk-taking situations are linked to the design and evaluation phases, in which the students interact with their peer group and the social environment. Based on the study results, it is important for teachers to pay attention to these situations and how the students behave. In this way, teachers can teach and support the students in identifying and taking controlled risks, which is an important skill in a changing society looking toward the future.